This was the first single by Bronski Beat to feature John Foster as lead singer and also the third single to reach No.3 in the UK charts. The song was also the last for the trio to reach the UK top 10. It was released as the lead single from their third studio album Truthdare Doubledare. It's an energetic synthpop number which features a very infectious chorus. I certainly remember singing this to myself for the rest of the day after I first heard it on Radio 1 while working in a vegetable packhouse during my first year of work - miss those days! "Hit That Perfect Beat" entered the UK single chart at #45 on 24th Nov 1985 while Wham! were at No.1 with "I'm Your Man". During it's eighth week on the chart, the single finally reached it''s peak position of No.3 for one week on 12th Jan 1986, while Pet Shop Boys were at No.1 with "West End Girls". The single also reached #3 in Switzerland, #4 in Germany, #7 in Italy and #19 in the Netherlands. It also reached #3 on the Australian Kent Music Report Chart. The song was used in the opening and closing titles for the keep fit programme Body Beat which aired in South Africa in 1989 and during the 1990s. A second single was released from Truthdare Doubledare. "C'mon! C'mon!" reached #20 in the UK and was the last single for the group to chart anywhere, and this was a strong indication that the group's popularity was in decline and that they were struggling without Jimmy Somerville's input. The 12" single featured three versions of the song. Remix (8:26), Original Mix (6:25) and Dub (7:10). 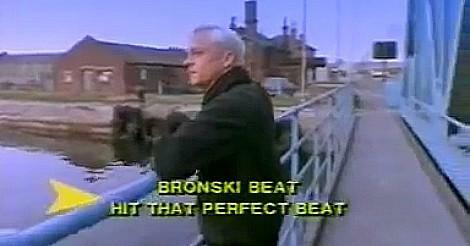 The video opens with John Foster walking around Stanley Dock in Liverpool, and much of the video focuses pretty heavily on the singer, not only around the docks, but also performing with Bronski Beat at The State nightclub in Liverpool. It feels pretty much like the group wanted to make it very clear that this is our new frontman and Jimmy is now history - get used to it! The song also featured on the soundtrack to the British romantic comedy film Letter to Brezhnev as track 1 on the B-side of the vinyl LP. The album also included tracks by Fine Young Cannibals and Sandie Shaw. You can listen to the extended remix of "Hit That Perfect Beat" in this video. It's bursting with energy and interesting synth sounds and certainly one of the more interesting 12" mixes to come out of the 80s.